I've been back from the Raw Spirit Festival for about five days, now. The first few days I couldn't stop crying. I have a lot to share with all of you, maybe more than you'll want me to share. While away some pretty amazing healing took place. I found myself lifted out of the past and delivered to the future, in a way. I am here, whole, and aligned with who I am on all levels. Pure Jeevan means Pure Life (or Total Life). Raw food is only part of my life, part of who I am, part of my journey. So, I'll be openly sharing who I am here in this blog; raw food isn't going to be the main focus---it's just part of my story and part of what I want to share. Until I can sit down to begin sharing everything that transpired while I was away and over this past five days, I'll share some pictures with all of you! 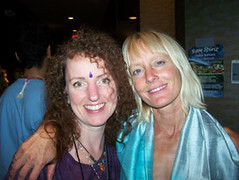 Here I am with Happy Oasis, the genius behind the Raw Spirit Festivals. Rawbin, my soul sister! She opened her heart and arms to me and I will forever be blessed for knowing her. Natural Zing's Jeff Rose gifted me with more than free festival tickets. I know we will always be connected and friends. 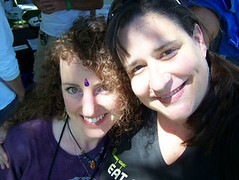 Me and darling Bunny Berry, creator of the famous Raw Fu Community! 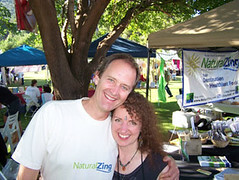 We worked the Natural Zing booth together and had a great time getting to know each other better! Glad to hear from you (even virtually!) The pictures are great, looks like you had an amazing time. I can't wait to hear what is going on...give me a call when you get the chance. I suspect all of those tears have been transformational, healing, cleansing tears. It is good to let them flow. I love you. I am here, whole, and aligned with who I am on all levels. You are positively glowing in the photos. I cannot wait to hear stories. All the pictures I have seen of yours have been beautiful. And in all the pictures you are in you look amazing and glowing with light. I hope the winds of change are gentle on you and yet they take you to your destiny as it should be. What is your dharma? What is your song? 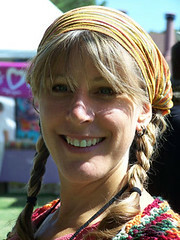 Hi Wendi - I saw photos of you and heard about you and then realized that I had already been reading your blog! SO many people had such nice things to say about you at Raw Spirit. I didn't go this year but plan on going next year. I love your raw directory and all the energy you put into your site. You are right that raw food is only a part of who you are so please do share more! Love seeing the pictures of you and the gang. Wow, what a great experience and memory for you! Thanks for sharing your wonderful experience. The pics are great but it would've been even better to be there to know firsthand all the love and happiness flowing. Everyone looks beautiful. Thanks for all the comments! :-) I love all of you!! We have a new WordPress version and now Disqus, so I should be able to keep up with comments a bit better!